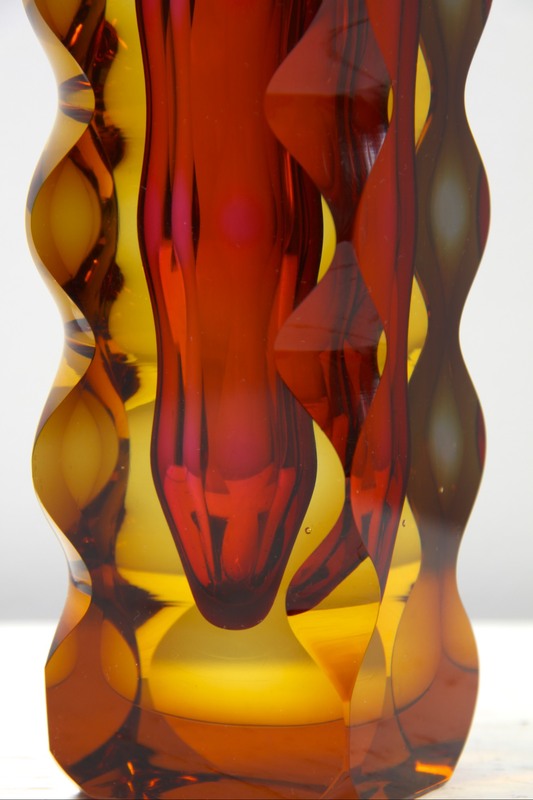 This is a Stunning Czech cased, cut glass vase, designed by Oldrich Lipsky for Exbor, Czechoslovakia circa 1964. A Striking Modernist design from Exbor, who produced cutting edge, modern avant garde designs during this period. 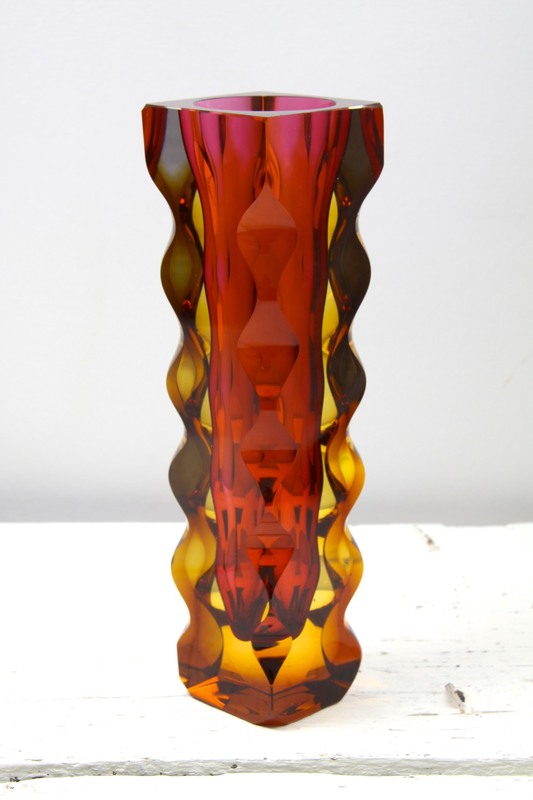 A striking example of the renaissance in Czech glass design in the 1960′s. From behind the Iron Curtain, re-establishing the country’s skilled designers reputation for producing unique art glass masterpieces. 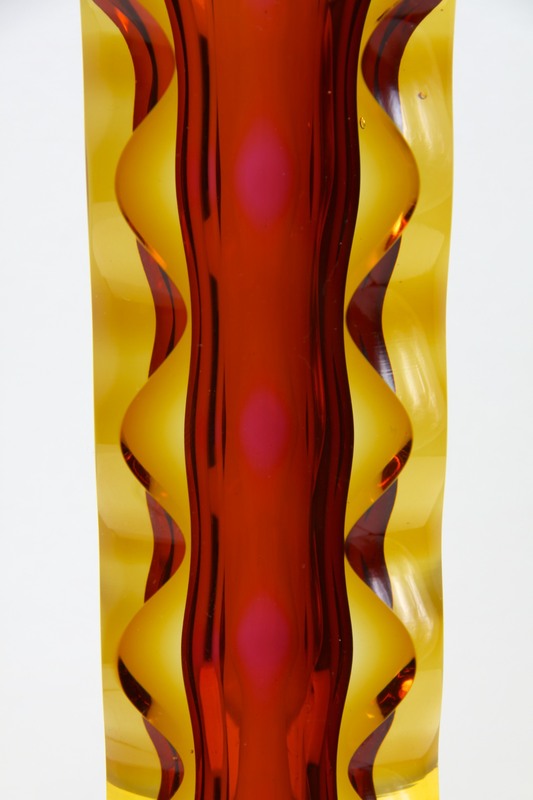 The vase with its cased thick / chunky glass in yellow and red, is cut with wavy undulating optical effects on the corner edges. Giving wonderful complex forms and catching the light beautifully and differently from every angle. Very unusual and a clear break from traditional forms, evoking the forward thinking Space Age era. A Great addition to any collection of Sklo /Czech or Art Glass. Would complement any retro, vintage, 60’s, 70’s, space age, modernist, mid century, minimalist or contemporary interior. In Excellent Condition, no chips or scratches, a few very tiny fleabites on the top, mentioned for accuracy, nothing to detract. Stunning overall on display. Marked to the base with the Exbor acid stamp, can be faintly seen in the base photo. Measures 21.5 x 8 x 8cm / 8.5 x 3.25 x 3.25in.